Natasha, Aleck, Chilli (our Gordon Setter) and I walked to Stockland and back yesterday. It took us two whole hours but it’s the first time we’ve walked that way and the four of us encounted many obstacles along the way! The fields were quite boggy but we weaved our way through them, and I taught the kids how to try and walk on the higher bits which were much dryer. The first stile fence crossing we had to tackle had a pipe placed just before it – with water gushing out which made the area all around the stile very boggy, something my 4 year old was not very comfortable with at all. I carried him over though and we all crossed the first hurdle in one piece! 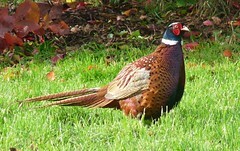 This one was so bad, Mummy had to not reveal her worries at all in order to get the kids across. Perhaps we shouldn’t have risked it, but I went first with the dog (who was not happy on the rickety wood!) to check it out. 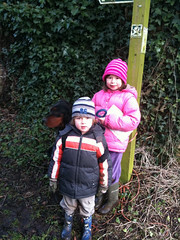 I tied the dog up at the other end and went back for Tash & Aleck, to walk them over one at a time. The whole bridge was slanting one way and there were a few slats missing and some others which luckily our feet did not go though! 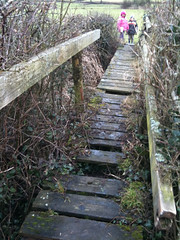 The whole bridge was very slippy and mossy too with wobbly handrails that you couldn’t use. Next bridge pictured below (yes there are a lot of bridges aren’t there!!) took us over the River Yarty. 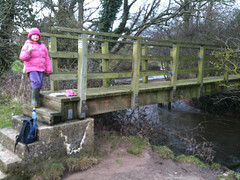 It was a top notch bridge and we all stopped for a well earned breather! Rosy red apples all round and a bit of a sit down on the steps of the bridge before getting back to the map reading. Tasha has just started map reading at school so a great opportunity to practice following the green dotted line across the Ordnance Survey map. At four, my little boy Aleck just loved the challenge of finding the next yellow arrow as we went along. 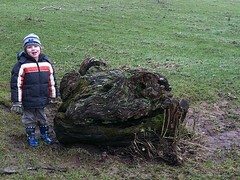 He also liked this curious dragon we found sleeping by the river – amazing what you stumble upon in the Blackdown Hills if you keep your eyes open ! 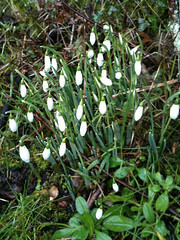 We made it home in one piece and saw the first snowdrops of the year, out near our neighbours home. 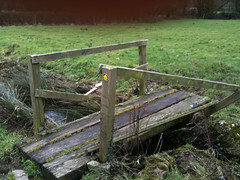 He was out enjoying the winter sunshine too and as he’s on the parish council, I took the opportunity to mention the 2 out of three bridge challenges we had, so hopefully something might get done about them, although I don’t imagine it will be the near future – will keep you posted!